After an all too long hiatus, the Ford Ranger is back and better than ever. Best-in-class gas-powered towing and payload are part of the Ranger’s charm thanks to its 2.3L EcoBoost® engine, capable of producing 270 horses and an impressive 310 lb-ft. of torque. Looking for an off-road ready pickup that can handle anything the road throws its way? Well then say hello to the 2019 Ford Ranger, available at Abbotsford, BC’s Magnuson Ford. How does Ford know that the 2019 Ranger can handle terrain it travels? Well, extensive testing for one. Durability testing on roads too tough for humans forced Ford engineers to bring in robots to drive the Ranger in the most extreme climates. Extensive lab testing, involving shaking the Ranger for days on end, have resulted in a pickup truck that Ford knows can handle the rigorous roads you’re sure to take it on. Built Ford Tough? That’s an understatement. 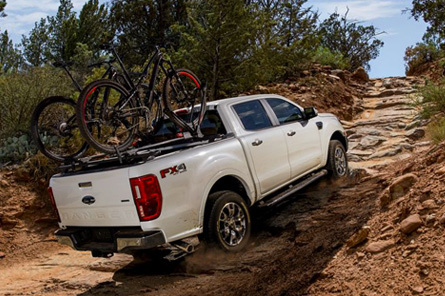 There’s no shortage of options for those who want to take their 2019 Ford Ranger off the beaten path. The available FX4 Off-Road Package includes specially tuned shocks, all-terrain tires, an electronic-locking rear-axle for unbeatable traction, as well as an exposed steel front bash plate and frame mounted skid plates to protect your Ranger from damage. Add Ford’s Terrain Management System™ and you’ve got even more control no matter the conditions. The 2019 Ford Ranger is back, and ready for all of your off-road adventures. 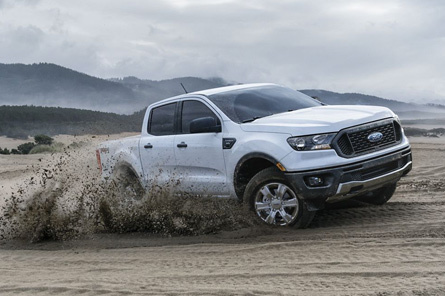 If you want to learn more about the Ranger, then contact us at Magnuson Ford, your Abbotsford Ford dealer.